Nightwish, A Tear Beyond and Fallen Arise live @ BUCHAREST - Benvenuti su atearbeyond! Hi Tears! We have some Great News for you! A Tear Beyond Live with Nightwish as main support @Romexpo in Bucharest, Romania, on 17 August! We also share the stage with an awesome band from Greece, Fallen Arise! 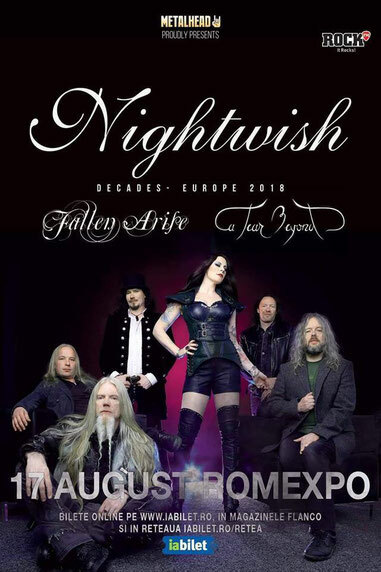 Abbiamo l'immenso piacere di annunciarvi che saremo di supporto ai Nightwish il 17 agosto al Romexpo di Bucarest! Prima di noi si esibirà anche un'ottima band dalla Grecia, i Fallen Arise.